It's just a few days before Christmas and our household looks like Santa Paws came early. Two doggy subscription boxes already! BarkBox shipped very early this month and I am terribly grateful. This is the first Christmas will "the Goo" and I want to have a laugh with her reactions to boxes and the treats inside. For the record, Goo is a 4 year old AmStaff and weighs about 55lbs. She's a rescue doggy who brings joy to the house every day. Lots of work too, but always joy! Frankly I couldn't wait... She probably could. BTW - Taking pictures with her is HARD! Ma, you are the slowest lady EVER!! She could not wait to get her chops around that log. It lasted the night which is a real accomplishment for any plush toy. It squeaks! Cost is $12. Oh hello treats she can eat! Cost is $8. Very cute! This nose appears quite often. From Orbee-Tuff this is a bouncy ball that is minty and you can put some treats in the holes. Made for big chewers! There is that nose again! She dearly loves these small chews. Also, I love the branded paper. 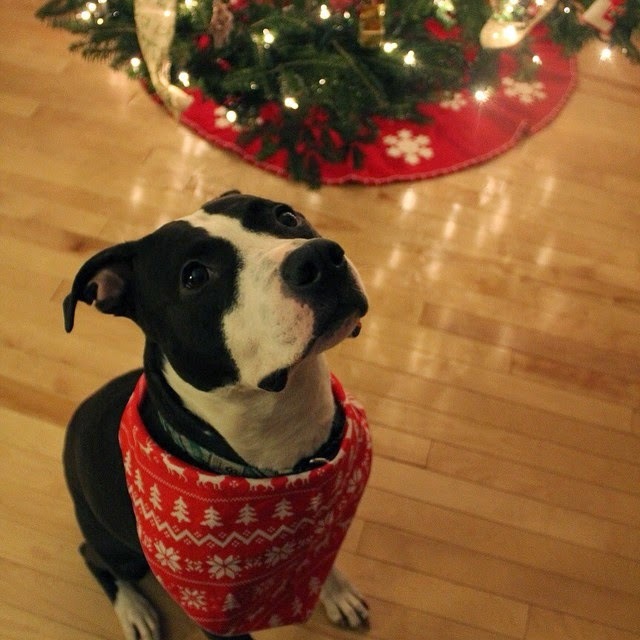 Happy Pawlidays! This box contains 5 items and costs $29/month or if you want longer duration subscriptions then the prices per month would be less (to $19/month for a yearly subscription). Shipping to Canada is an additional $5, shipping in the US is included. With the new BarkShop they are offering a discount code to get $10 off your first order. Use WelcomeToBarkShop at the checkout. They will also donate $5 towards rescuing a dog when you use this coupon. Here are my BarkBox reviews.